Who Are We..and Why Are We Doing this? Here are some video clips of riding in Iceland. Some of the characteristics that the Icelandic horse displays can be seen in them, and the landscapes of Iceland come through a bit also. 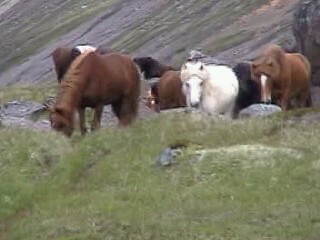 On our first trip to Iceland we were amazed to see how horses are cut from the herd. 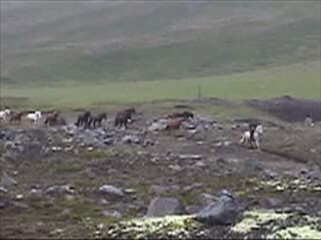 In the video below Jon Petur is in the middle of the herd. Has a bridle, and Ingolfur, in the green jacket, is there with a brown paper bag. The bag has a few pieces of bread in it. Icelandics love bread and after a lunch break on the trail they know that they may get some so they are are quite sensitive to the russle of a bag. In this instance the horse selected isn't lured in with food however, but two men on foot who know how horses think quietly outmanuever her. Here are some clips from this ride. It was written up in Gourmet Magazine by Verlyn Klingenborg. He's in the yellow jacket. Verlyn wrote - "We rode horses with a lineage 1,000 years old across farms that had borne their names for centuries while farmers and guides, on horseback. spoke an ancient language into their cellphones." 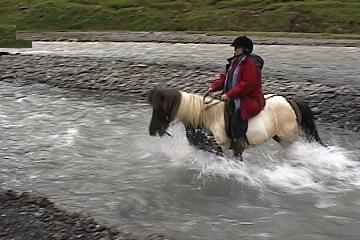 Much of the footage was shot from the backs of horses and all is hand-held, just for fun, with no plans to publish it. We used very simple editing and streaming. It may not be art but it was FUN, and only on a few occassions did I have to stuff a still-running camera into a pocket and deal with a horse that wondered why we were being left behind and why her rider wasn't paying attention to her! We'll be putting more clips up from time to time, and we hope to make some time to put up some explaining text. Windows Media Player seems to open these files OK - let us know if you have any trouble. 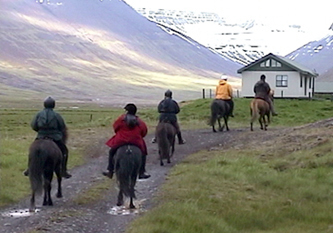 These clips do show a little bit of the way Icelandics are ridden. As a rider (unless your experience includes riding Icelandics) you might find the seat confusing!